Look for the picture inside the picture. It’s not always easy to see, but it’s always there. And if you miss it, you can miss the world. And while the biblical implications of that statement are at odds with what I believe to be the Truth, still – it makes me pause. When I started this silly little blog in April of 2008, it never dawned on me that I would be so inspired by so many talented, amazing people. Among those near the top of that list would be Jeanne Damoff. Okay, so maybe she’s not so much like me. She holds degrees in social work, sociology, English, and secondary education. Wife to George, mother to Jacob, Grace and Luke. From her bio: “Jeanne is a published writer, a professional choreographer, a musician, and a speaker. She loves to laugh and gives points to anyone who makes her laugh out loud. These points are very valuable. Everyone should strive to earn them, starting now.” As impressed as I was with her writing thus far, I was completely unprepared for the book she sent me. In May 1996, the world ended. We traded “Happily Ever After” for brokenness and sorrow. 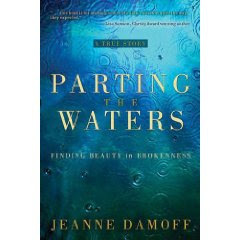 My book, Parting the Waters: Finding Beauty in Brokenness , tells the story of Jacob’s drowning accident and our family’s subsequent journey through a valley of lost dreams and into a deeper understanding of God’s sovereignty. As our eyes adjusted to the shadows, the beauty of God’s plan came into focus. A pebble is dropped into a pond. Ripples are set in motion. Ever widening, they accomplish eternal purposes visible to those who choose to see. I literally have a stack of books four feet high that are waiting patiently to be read. But once I picked up Jeanne’s book, I could not put it down. If you’ve ever struggled to understand why bad things happen to good people and can’t seem to find the silver lining in the clouds of life, I would highly recommend this book. And you know I know a good book when I read one, right? Okay, so maybe she’s not so much like me. She holds degrees in social work, sociology, English, and secondary education. Wife to George, mother to Jacob, Grace and Luke. From her bio: “Jeanne is a published writer, a professional choreographer, a musician, and a speaker. She loves to laugh and gives points to anyone who makes her laugh out loud. These points are very valuable. Everyone should strive to earn them, starting now.” (Apparently, I have earned a few points along the road, because she has graciously agreed to guest post for me very soon.) As impressed as I was with her writing thus far, I was completely unprepared for the book she sent me.